Take your Champions on a journey through the Sword Coast. Players will be able to explore familiar locations within the Forgotten Realms as they tackle each adventure. 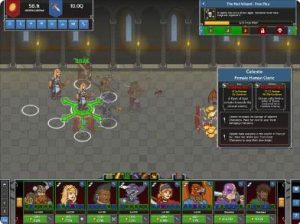 You can download and play Idle Champions of the Forgotten Realms for free, however some premium in-game items can also be purchased for real money. Gems earned for free in-game by killing bosses and completing adventures can be redeemed in the in-game Shop for Silver and Gold Chests that contain equipment, potions, contracts, and gold. Gold Chests can be purchased for real money if you do not want to wait and save up gems for them. Bonus “Golden Epic” equipment cards are generally only available as a purchase bonus for real money transactions, however, specific Golden Epic cards may become available through free means at Codename Entertainment’s discretion. In-game purchases range from $2.99–$49.99 USD (or equivalent local currency) per item. (1) Chance of a Rare equipment card in a Silver Chest is approximately 3.2%. (2) Chance of a Rare equipment card in a Gold Chest is 100%. Chance of an Epic equipment card in a Gold Chest is approximately 12%. To mitigate bad luck, a system exists to guarantee at least one Epic equipment card within every 10 Gold Chests. (3) Chance of a Shiny equipment card in a Silver or Gold Chest is approximately 0.1% per equipment card.